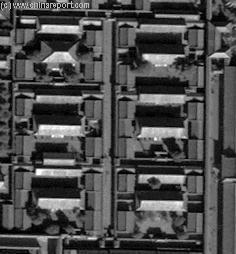 Satellite Overview of Yi Kung Gong and adjacent Chang Chun Gong and surrounding area of the Palace Museum (Gugong). 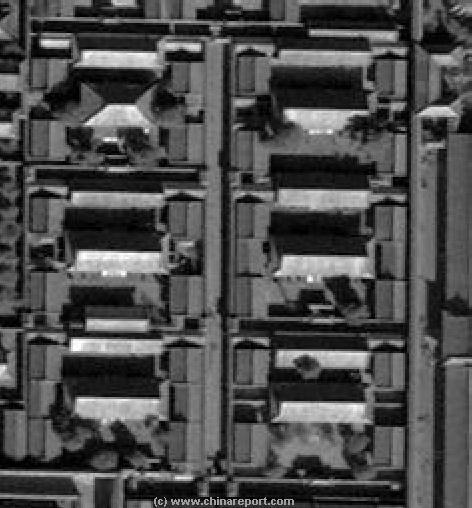 Satellite Overview of Six Western Palaces and surrounding area of the Palace Museum (Gugong). 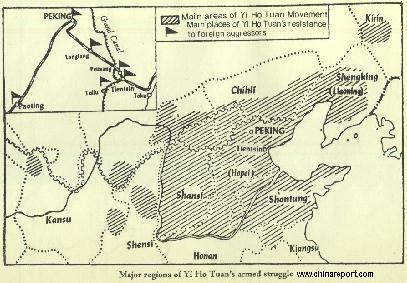 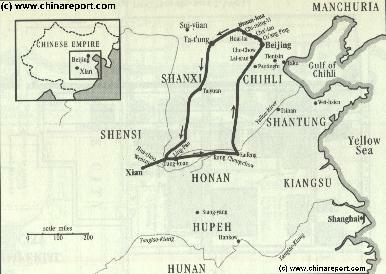 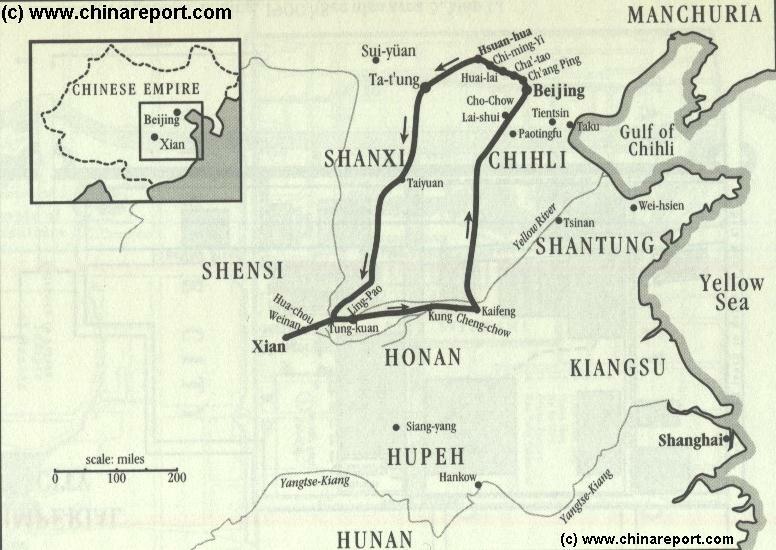 Schematic Map depicting the area's of North-Eastern China overtaken by the Yi Ho Tuan Movement of 1900 AD (The Boxers). 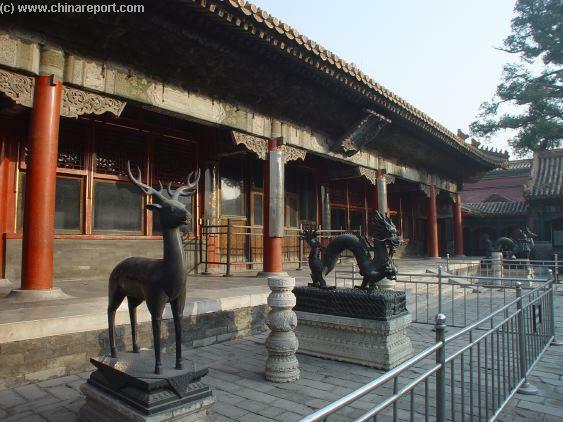 The Chu Xiu Gong (储秀宫) or Palace of Gathering Excellence was built in 1420 and was orinally known as the Palace of Longevity. 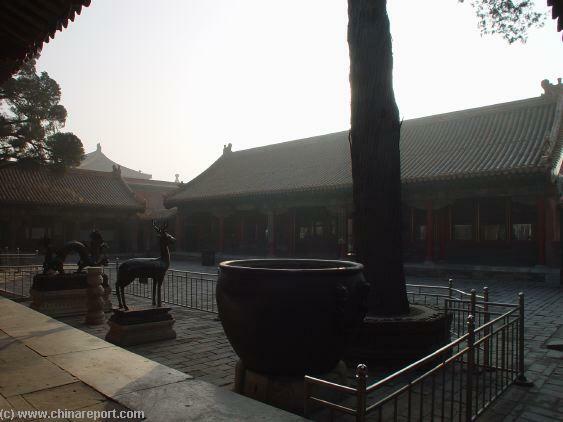 It aquired its current name in the year 1535 A.D. and rebuilt in 1655. 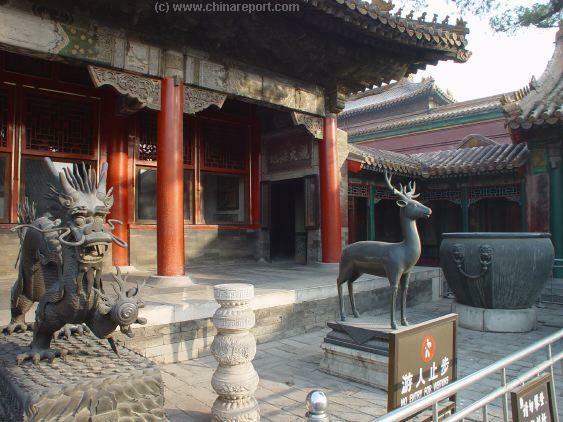 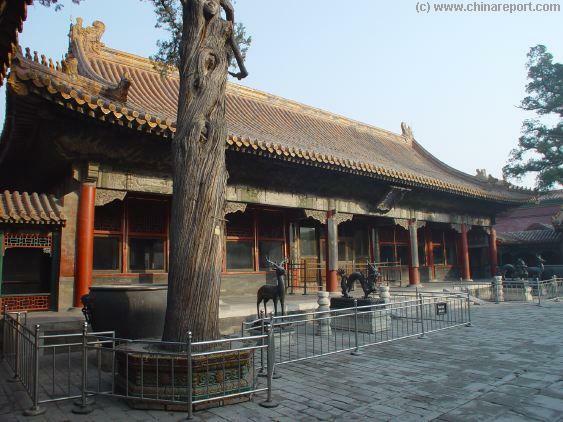 During the Ming and Qing Dynasties, it was the residence of Empress and Imperial Concubines. 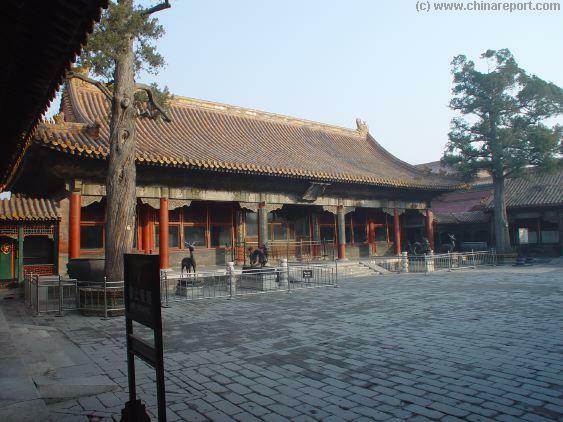 In the year 1852 Ci Xi was assigned her living quarters in this back-corner of the Imperial Palace in accordance with her person being created honourable person Lan, one of the many consorts of the Great Emperor. 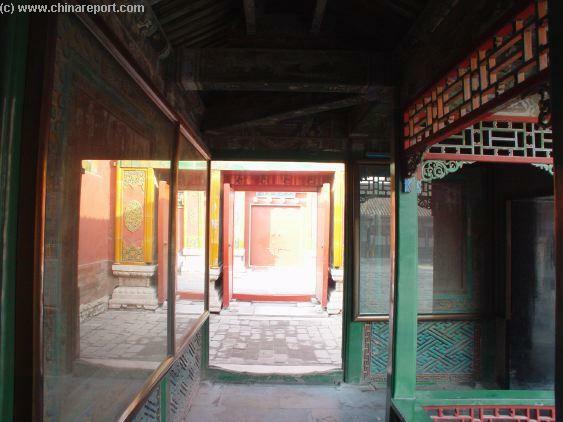 Will living in this Palace it was that she gave birth to the Emperor Tongzhi here in 1856, leading her promotion to the high rank of "concubine Yi" being the mother of the Emperor's first born son. 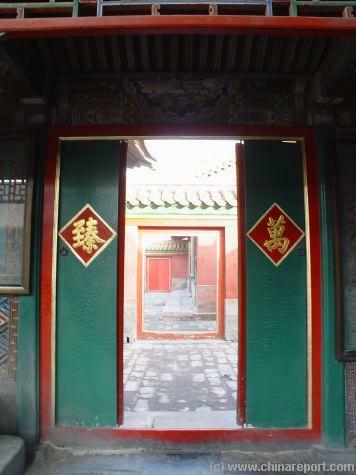 In 1884 the entire palace was refurbished and redecorated for the Empress Dowager Ci Xi, while the entire six western palaces were restructured with the removing of gates of eternal spring and the gate of gathering excellence to make room for an enlargement of Palace of ternal Spring as well as the addition of the two minor halls, the Hall of Manifest Harmony and the Hall of Manifest origin. 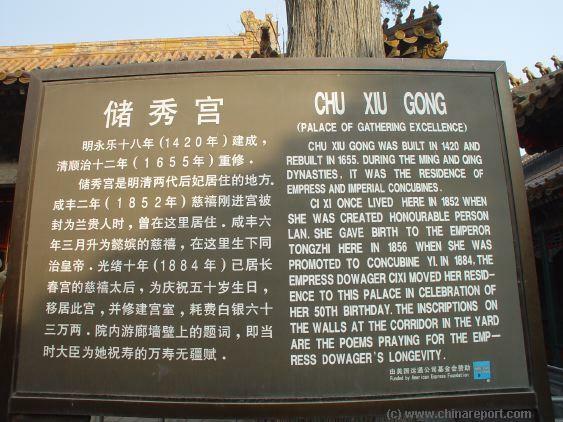 After the extensive overhaul of the "six western palaces" the Empress-Dowager moved her residence to this palace in the 10th month of that year in celebration of her 50th birthday. 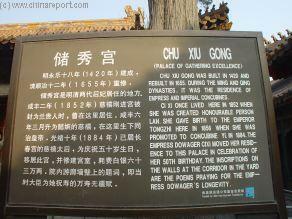 The Empress-Dowager, de facto ruler of China, would live there for 10 years afterwards. 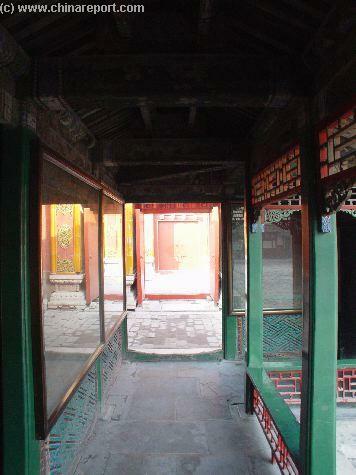 The inscriptions on the wall at the corridor in the yard are poems praying for Empress Dowager's longevity.